A few months ago, I took on the responsibility of organising my sister’s hen/bachelorette parties. Yes, I used the plural – ‘parties’ – because the madam decided that she’d have one hen party abroad (for those who could make it to another country) and one nearer to home (for everyone else who couldn’t) – apparently it’s the new thing to do. Having only ever been to one civilised hen party before taking on this mammoth task, I was a little lost for ideas, so I had to be inventive. I wanted to share the games I researched, and created, to help those ladies who are stuck in a similar rut – with a hen party to organise, and a limited amount of time to get it together! Remember, the main aim of the party is to make a fuss of and embarrass the bride-to-be, while entertaining her hens. -Wedding-themed memory game: If the hens don’t know each other too well, this is a quick way to break the ice. The first hen starts by saying: ‘My name is ______ and I’m taking a _____ to [bride-to-be’s name’s] wedding. So if the hen’s name is Sally, and the bride’s name is Mary, Sally would say: ‘My name is Sally and I’m taking a sausage to Mary’s wedding.’ We played it so the name of item also began with the hen’s first initial, so Sally took a sausage, and Laura took a lizard. The next hen has to repeat Sally’s item, and add one of her own, etc. -Interesting fact: This is another great icebreaker but it takes some preparation. In the run-up to the hen party, ask the hens to tell you an interesting fact about themselves. Then, at the party, read out the fact and ask the rest of hens if they can guess who it relates to. We had some hilarious revelations: one hen was a member of a medieval re-enactment group, one liked to drink tea in between a drinking session, another owned 60 pairs of shoes – you get the gist! -Pin the willy on the bloke: A variation of the traditional Pin the Tail on the Donkey game – simply replace the donkey with a hunk, and the tail with a willy. I did a DIY job with preparing this – I just stuck lots of pieces of paper together and drew on a life-size hunk, then used Blu Tack to secure to the wall. Draw or print off a cartoon willy, cut round it and use Blu Tack to give it a sticky back. If you don’t have time, just buy the game . Blindfold the hen, swivel her round a few times and then let her pin the willy. We wrote the hen’s name on the spot she pinned to compare performance! –What’s in your purse? The hen with the weirdest things in her purse is likely to win this game. Hens get points for the items they arrived at the party with – so, for example, as the host, you would ask: ‘Who has a receipt for shoes in their purse?’ and all those hens who have one are awarded 20 points. You can make a list of a range of things, such as: toothbrush – 5 points; picture of partner – 5 points; condom – 10 points; PMS medication – 15 points; spare underwear – 20 points; a pen which isn’t black or blue – 10 points, etc. The hen with the most points wins! 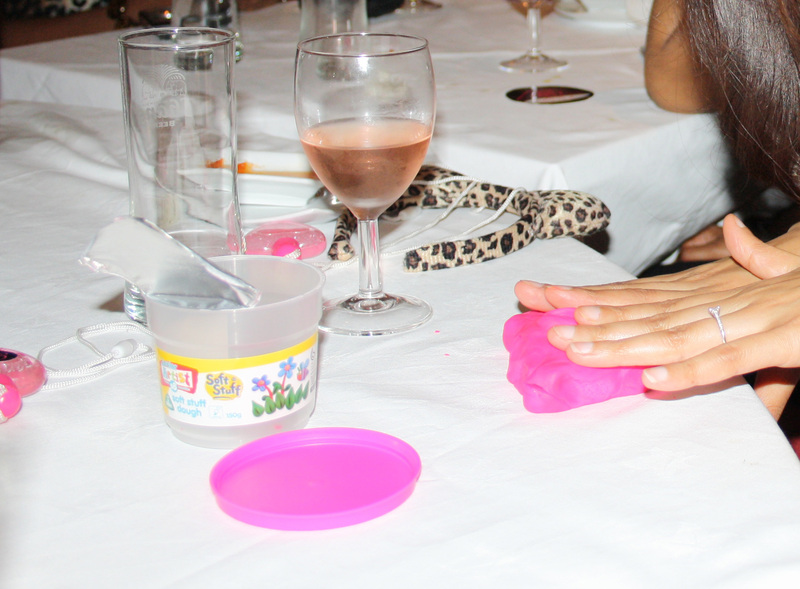 -Mould the best willy: Arm some of the hens with Play Doh , and challenge them to model a willy. If you’re feeling really adventurous, get them to do it blindfolded, or with their eyes shut. The rest of the hens then vote the winning model. -Pass the bouquet: This is just like musical chairs, but it uses a bouquet. Get your hands on false flowers, or real flowers if you fancy it, and you’ll need one of the hens to control the music. Get everyone else to stand in a circle with their back to the centre, and while the music plays the hens have to pass the bouquet to the person next to them. The person who is holding the bouquet when the music stops is eliminated, and the last person standing is the winner! -The biscuit game – You’ll need a packet of digestives from the supermarket for this game. Get hens to bite the best heart, bouquet or willy shape and compare the results at the end – awarding prizes for the best willy, biggest willy, or biggest heart, for example. -Mr & Mrs Quiz – Get the groom to fill out a quiz, and the bride-to-be to guess his answers. Turn it into a drinking game by making her take a shot for every answer she gets wrong. Here is a list of questions I gave to the groom > Questions for groom. -Bridal pictionary: Based on the well-known Pictionary game, for this you need pieces of paper and pens. Think of wedding-related words, such as rings; flowers; bride; champagne; cake; music; wedding dress; 27 Dresses; bridesmaids etc and write them on small pieces of paper. Split the hens into teams – perhaps ‘The Bride’s Team’ and ‘The Groom’s Team’ and get them to take turns in picking a word and attempting to draw it using pictures. The team that guesses the most correct answers wins. -True or false: Gather 10 to 15 facts about the bride-to-be. Half should be true and half should be false. Get the hens to try and decide which ones are true! -I Have Never – drinking game: One hen starts by revealing an ‘I have never’ statement such as ‘I have never eaten a whole box of chocolates’ or ‘I have never lied about my age’. Those hens who have done this – who have eaten a box of chocolates, or have lied about their age – must drink. Then the next hen says what she has never done, etc. -My first kiss: Get the hens to go round and reveal details of their first kisses… Prepare for lots and lots of giggles. It’s great fun to set a dress code for the hen parties. We chose nerds, where we wore oversized glasses, braces, knee high socks and drew on zits. We also dressed up as Disney characters – we coordinated so we were all different characters, from Cruella de Vil and Pocahontas to Snow White and Minnie Mouse. For the final night we dressed up as animals – so the girls wore animal print dresses and tops, and some wore ears, tails and I got hold of some face paints, too. If you like this post, why not subscribe to The Curious Londoner, or else follow me on Twitter @kavishah1. You’ll need some make up and hair accessories for this one. Get the bride to be to sit in a chair in the middle of the room. Then each guests take it in turns to do a bit of her make up or hair. The twist is that the person performing the make over at any given time is blind folded! Hen parties are always colorful. Some traditional and old plus some new innovative games would be the best combination for hen parties. where did you get those mini bubbles!!!!!???? it all at the moment but I have bookmarked it and also added your RSS feeds, so when I have time I will be back to read a lot more, Please do keep up the excellent jo. Hi Fern, should now work! Link is also here: https://shahkavi.files.wordpress.com/2012/07/mrmrs.pdf Thanks! Thanks for your summary & suggestions. It’s been difficult to find recommendations for a Hen that weren’t tacky or crude! Your post has been incredibly useful! Awesome! I am a bridesmaid again (for the 4th time) so i’ll be using these suggestions for sure. Love you website, some great tips here!